Cornerstone content is the foundation of your content marketing plan. It will help you establish a clear picture of the specific problems you can solve for potential customers. Accordingly, cornerstone content is vital for both seasoned bloggers and anyone launching a brand-new website. 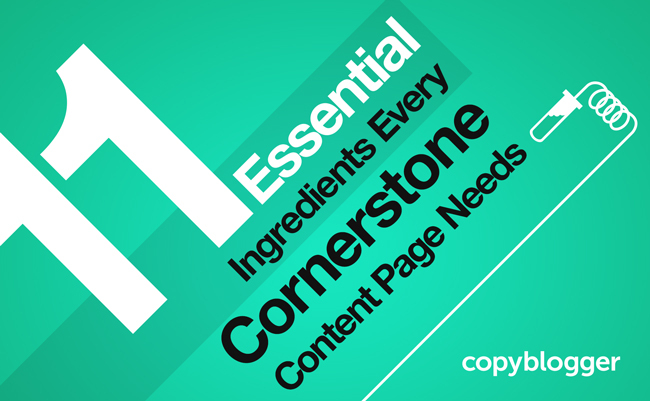 In this article, we’re going to explain the 11 essential ingredients of a cornerstone content page and present everything you need to know in a handy infographic. If you want to work on your own site’s cornerstone content with the help of the Copyblogger team, sign up for our Content Challenge below the infographic. The first step is keyword research. A cornerstone content page will help you rank for keyword phrases in search engines. Select 8 to 12 keyword phrases and create a cornerstone content page for each one. Your group of keywords will also loosely define your area of expertise, which helps you build authority. Each keyword phrase begins the headline, but remember that the rules of good headline writing still apply. Also, the headline that appears on the cornerstone content page can be different from the headline that appears on search engine results pages. Your headline is also a title tag that appears on search engine results pages. Search engines want to offer relevant results, so write an additional SEO Title using language the searcher would use to find your content. You want to speak to the prospective reader in his or her own chosen words. Most content management systems, including the Rainmaker Platform, allow you to fill out an SEO Title tag. The top of your cornerstone content page should immediately draw in your visitor — and keep her reading. The body copy of your page should contain a blend of educational content and links. The educational content gives your reader a broad understanding of the topic. The list of links highlights other articles that expand on the topic in very specific ways. This mix of information also gives search engines more content to filter and index. An extension of your main headline. Mini-headlines sprinkled through the page. Underneath your main headline, you can add a subheadline that provides another incentive for the visitor to keep reading, as well as more copy for search engines to index. Additional subheadlines inserted throughout your text break up the copy, entice the reader with more benefits, and help search engines determine the topic of the page. The same writing rules that apply to headlines also apply to subheadlines. A strong cornerstone content page will include other media formats like images, videos, and infographics that fascinate readers and encourage them to share the page. Investing in a professional designer for certain types of media could make the difference between a winning cornerstone content page and a flop. Bullet points are a killer way to draw the visitor’s eye to meaningful and persuasive copy. An effective conclusion feels like the click on a box being shut. There are no loose ends. In addition, a good conclusion culminates in a persuasive call to action. All the copy that precedes the conclusion was driving towards this appeal. So craft it carefully. And don’t be afraid to repeat the call to action more than once. Every cornerstone content page you create has a goal: to get people to act. Remember: you don’t have to wait until the end of the content to include a persuasive call to action. In fact, include call to action buttons early and often to show readers what you’d like them to do. You can’t only rely on search engines to drive traffic to your cornerstone content pages. Particularly if a page is new, you’ll need to jump-start the process. Post your cornerstone content on social media and encourage people to share it. Add big and bold social share buttons at the top and bottom of the page or use a scrolling sidebar that moves down the page as the user does. And check out our SlideShare presentation! Now you can evaluate your cornerstone content pages at a glance and be sure they have every element they need to deliver the results you need.